We'll be closed for the Easter (Good Friday, Easter Saturday, Sunday & Monday) and Anzac Day. We wish everyone a safe and enjoyable Easter! Discover the details that make Complete Kitchens unique – from innovative design touches and exceptional workmanship to the professional service from first meeting to installation. Visit our inspiring showroom to get started. As the heart of every home, we understand that your kitchen should be a true reflection of your individual personality and something you will enjoy for many generations. The engine room of the house. Let us make you laundry an efficient and functional room that is a pleasure to own. The bathroom has evolved to a personal space of sanctuary and relaxation. A place to indulge yourself after the long day. Enjoy the great outdoors with a relaxed Alfresco outdoor kitchen area for an all year entertaining area that the whole family can enjoy. Our Alfresco kitchen showroom displays a range of outdoor kitchens with all products built for outdoor use. We specialize in complete home joinery -custom wardrobes, entertainment bar... Whether you need a special home for an extensive book collection or the perfect home cinema room cabinetry, we can help. Real people, real homes, real kitchens. Renovating a kitchen is such an exciting journey for every home owner and we love being part of it! At Complete Kitchens we apply our creative flair, attention to detail, professional planning and excellent workmanship to every one of our projects, turning your dream kitchen into a reality. Our philosophy is “To give the client our very best”– from your first point of contact through to the completed project. Founded in 1978, Complete Kitchens has over 40 years experience in kitchen renovations. During that time we have created a large range of custom made kitchens and with our Kitchen and Bathroom Design Institute (KBDI) accredited design team we keep well informed of the latest kitchen design trends and new product releases. Our kitchen showroom in Oakleigh South is one of Melbourne’s largest showcasing over 20 kitchen displays including French Provincial Kitchens, Modern Kitchens, Traditional Kitchens and Alfresco Kitchens. We have a wide range of finishes, fittings and accessories on display and encourage our clients to view our extensive factory located at the rear of the showroom. For every one of our custom kitchen designs, our main focus is YOU – the customer. To achieve the best possible outcome for you we focus on designing a kitchen that is functional, efficient and tailored to your specific needs. 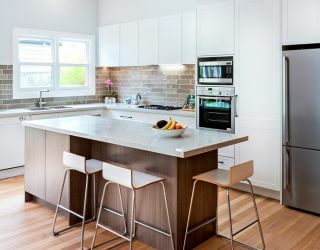 Our highly experienced in-house kitchen designers are here to help you explore the variety of styles and finishes available and answer any queries you may have regarding costings, timeframes, trades and how the process works. Our designers are here to guide you through the whole kitchen renovations process. Ready to begin? Arrange for an in-home design consultation today! Why choose our complete kitchen design experts? 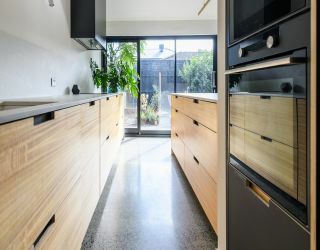 At Complete Kitchens, we are proud to have manufactured over 18,000 custom made kitchens throughout Melbourne and our emphasis on quality and attention to detail has enabled us to remain one of Melbourne’s premier kitchen manufacturers. Our in-house manufacturing facilities allow our expert design team and outstanding cabinet makers to work closely together ensuring your new kitchen is of the highest quality. When required we provide expert tradespeople who facilitate in the removal of your existing kitchen, installation, plumbing, electrical and plastering works. The Complete Kitchens team turn up on time, are reliable, honest and take pride in their work giving you the best service possible. For all our services, call us on 9543 8888 or visit our showroom today to get started!